It almost seems embarrassing to admit that I’d never been to the iconic “Half Moon Drive In” until Friday evening. Our house was too hot to even think about preparing a meal and we decided to hop in the car for a mini “Manitoba Stay-Cation”. The Half Moon is located on Henderson Highway just this side of Lockport, MB. We have driven by many times and in all honesty, I always thought it was an “order at the window” style drive in. Although you can order from the window, the experience is really all about the fabulous retro “eat-in” style diner. I know this isn’t news to most Winnipegers, as I’m sure I’m among the minority who have never been there before, but believe me it’s no wonder that it’s been so popular for so long. It is like stepping back in time, with the chrome edged tables and checkerboard tiled floor. The decor is really great and our food was delicious. The Half Moon serves what I would consider to be typical drive in food: burgers, hot dogs, fries, onion rings, shakes and ice cream. We ordered 3 burgers (various kinds), large fries, chili fries, 2 shakes and a pop all for under $36. I was pretty impressed with the price as I think we spend almost that much on our rare trips to McDonald’s. I ordered the Saturn Burger which was loaded with toppings including bacon and onion rings! It was really delicious and I was so disappointed when I took the last bite as I wasn’t ready to be done. Everyone enjoyed their meal and I’m certain this will be the first of many trips! Aside from the great food, there is also an arcade for the kids to enjoy. I know most people have heard of the Half Moon, but if like me, you’ve never taken the time to check it out, do so. You can also enjoy the nice drive down Henderson Highway. There are many spectacular homes along this stretch and to make the most of the excursion, I suggest making it a round trip and taking Henderson one way and River Road the other. It’s also a beautiful drive along the other side of the river (River Road) with many huge homes and a few historical landmarks. Some of the oldest buildings in Manitoba can be found in and around the Lockport area. Of course, Lockport is probably best know for the fishing. The community website is actually quite informative and offers some history of the area as well as information on fishing and their annual Lockport Dam Family Festival which will be held September 12th and 14th. Tim and I have always loved camping and despite owning a cottage for several years, we decided that our kids should get to experience tenting just as we did growing up. When we sold our cottage, we decided to upgrade our tent to one that would fit the whole family. Over the years, we have collected what I would consider to be a good assortment of gear and gadgets to help make tenting easier. 1. Make lists. Several years ago, I took the time to create permanent camping lists that consisted of everything we need for a tenting trip. I then tried to divide it into “themes”. Here is a copy of my list. If you click the image, you can print the pdf version of it (it is much clearer than the screen shot). The recreation list fluctuates depending on where we are going. 2. Pack permanent camping tubs. If you plan to do a lot of camping this is worth its weight in gold. I used the “themes” from my list to create permanent camping tubs. We had enough gear that for the most part, the items can stay packed away inside the appropriate tub until our next adventure. I found this to be a huge benefit when it came to packing for our next trip. When you have a camper or a cottage, you basically leave everything you need inside and really only have to worry about packing food and clothes for each trip. Of course, with tenting there is no permanent storage place for all of your gear, so besides having to set up an entire camp each time you venture out, you also have to pack from scratch each time. This is a huge amount of work and can often be both overwhelming and exhausting. Making permanent tubs/lists allows you to spend less time thinking about what you need and worrying about what you may have missed. 3. Do a tub check. Before each trip, I do a quick check of each tub and its contents to be sure that everything I need is there and that consumables have been topped up. This only takes a few minutes and allows you to feel that you have everything you need. 4. Plan your menu. You want to make sure you take the time to plan out your camping menu in advance because there is nothing worse than miscalculating your food needs. If you over pack, it may mean waste, especially for those items that need to be kept cold and of course, you don’t want to run short of food either. Organizing the food for tenting is by far the hardest job. For every item on your menu, you need to ensure you have all of the ingredients for the recipe as well as items such as butter and oil for frying. Over the years, I have found that using the same menu (or close to it) makes for much easier planning. Depending on what time your family “rises”, you may not need to make lunch at all ~ especially if you’ve had a good hearty breakfast to start the day. Pasta Salad – I always make the pasta the day before we leave and add the dressing (oil/vinegar based) to it. I cut up all of the veggies for the salad and then stir them in on the morning of our departure. We always have pasta salad on the first night along with whatever meat I have placed on the menu. Cut up veggies. It is great to have fresh veggies cut up for snacks or to accompany a meal. This is also great if you are planning on having skewers. I always make sure everything is washed and chopped before we go. Hard Boiled Eggs – I will sometimes boil eggs and take them along. I have used boiled eggs as a healthy snack, lunch addition, for egg salad sandwiches, to make devilled eggs or as a salad ingredient. Baked Potatoes – I will often bake several potatoes in the oven or microwave prior to our trip and then put them in the fridge to chill. These cooked potatoes can then be used to whip up a fresh potato salad or chopped up for hashbrowns. Green onions. I often take a small container of chopped green onions that can be sprinkled on eggs or other dishes. Grated Cheddar Cheese. Depending on our menu, I will sometimes grate cheese at home and then pack it up for use on quesadillas or an omelette. Freeze one or two gallons of water. I use large milk jugs for freezer packs. This needs to be done several days in advance to freeze properly. I fill the jugs about 3/4 full to allow for expansion and leave the cap off until the water freezes. These make excellent ice blocks that will last for up to 3 days at no cost to you. 6. Packing Clothes and Toiletries. Don’t over pack. Check the weather and pack accordingly. Often one or two sets of clothes is plenty, especially if you plan to spend your days at the beach. I find that the clothes I don’t wear often end up smelling a bit musty just from sitting in the tent and it seems silly to wash clothes that haven’t even been worn. Nights can get cold, so make sure to take warm jammies and/or sweats for layering up if need be. A dining tent is essential if you are going to survive the bugs and potential rain. We just bought this Roots one to replace our old one and we love it. This Hang-Anywhere Clothesline can be purchased at Lee Valley. This fire fork can be purchased at Lee Valley. I take both the roll and the sheets. Buy heavy duty and don’t leave this at home. It is much easier to use foil than wash dishes!! It’s also great for left overs. Planning a camping trip can be a lot of work, especially when you have never done it before or at least not for a very long time. Hopefully some of my experience can help make your next camping trip a little easier! Happy camping! 1. Everything that is in the dish tub comes out and is used within the camp. The tub itself is about 2 gallons (I’m totally guessing). I use the actual “dish tub” as my “dish tub” for doing the dishes. So in fact it is not only used to storage and transfer the materials, but also for doing dishes. 3. The “ditty bags” (I spelled that word wrong on my list) are mesh draw string bags that can serve several purposes. We use a large one for our dirty laundry, medium sized ones are great for putting wet dishes in and then hanging them on the clothesline to drip dry, and the small ones are great for putting your shower gear in and hanging on the shower head if there is no shelf. What takes 4 hours and is a whole lot of fun? You guessed it, a Stay-Cation to the new and improved Assiniboine Park Zoo in Winnipeg, Manitoba. I know this is going to sound a little strange and my kids thought I was a complete moron, but I actually got a little choked-up at the zoo today. If you know me at all, you’ll know that it was not because the animals are being kept in captivity, as I can’t really say I have a huge tender spot in my heart for animals, especially wild ones. It’s not that I don’t respect the animals, it’s just that I don’t put much time or energy into thinking about what’s in their best interest. I just don’t get caught up in animal rights. I believe animals should be treated well, but its not my cause in life. I do love the fact that new exhibit has a strong focus on conservation and educating people about the impact that our actions have on the natural habitat of animals and their entire ecosystem. However, as I said it was not the animals that had me choked-up. It was that I was so impressed and proud that the zoo, our zoo, had finally been taken to a whole new level. It is truly a very well-planned, visually appealing and user-friendly zoo. It gets 4 stars from me and not because I don’t think the new exhibit is worth 5, but more so because I know that this is only the first step in the journey to take our zoo to being a top ranking facility in North America, if not world-wide. Absolutely fabulous! Even before we knew we had reached the entrance, you could sense the change in the surroundings. The trees and greenery took on a different look that totally set it apart from the rest of the zoo. There were so many great things, it’s hard to recall them all. I loved the inukshuks that were scattered throughout the exhibit as well as the large one at the entrance that provided a great backdrop for a photo. The “rocky landscape” was beautiful and everything seemed so realistic. As you moved from one exhibit to another, everything just seemed to flow. It was so cool to see the ducks openly wandering about the open tundra. The movie in the round room was spectacular. It was very informative, but yet totally engaging and completely captured our attention. Of course, you can’t help but love the awesome view of the swimming seals/polar bears from beneath the surface through the “aquarium” tunnels. The entire exhibit was really impressive. Unfortunately, I don’t have any great pics of the animals, as most were either sleeping or behind glass. Evidently the butterfly garden opened in 2011, but I had never seen it before. The flowers in the garden are beautiful and it was amazing to see so many different types of gorgeous butterflies fluttering about. Having just been there in June, I noticed that many of the old exhibits had also been upgraded as well. The entire presentation just seemed so much more professional and classy. I’m not sure if I hadn’t noticed before or not, but I also loved how there were several picnic tables scattered in different green spaces throughout the zoo, so that you could stop for lunch, a snack or just take shelter from the sun and relax your legs. Picnic tables are dispersed throughout and there is also a large tent for shelter. The kids and I spent about 3 hours in the zoo. We saw all of the exhibits, but definitely passed by some more quickly than others. We took water with us, but didn’t take any snacks and were ready to go by the end of the 3 hours. We all really enjoyed the afternoon and would highly recommend you check-out it out. It really is a must see. We didn’t even have much to look at in terms of the animals activity levels as most were trying to avoid the hot sun and snoozing in the shade, but it was still a great day. The admission for one adult and two children was about $46 with tax and worth every penny! We basically did it all wrong today, but we had an open afternoon and I really wanted to see the “new” zoo, as I had highlighted it in a previous post and was quite excited. When we go again, I will make sure I follow my own tips. I know from our visits to other zoos, that the best time to visit a zoo is either first thing in the morning or later in the evening when the temperatures are cooler. The perfect conditions are generally in the morning with overcast skies or light rain. In 2011, we visited Jack Hanna’s Zoo in Columbus Ohio. It was actually a really hot day, but we were only in Ohio for one day, as we were on a road trip, so we didn’t get to pick the day. As it turned out, the skies became overcast and we were caught in a huge down pour that lasted about 30 minutes or so. In the end, it was by far the best zoo experience we had ever had. The polar bears were partaking in some kind of a private party that involved a diving contest, the mandrills were mating (now that’s not an image you’ll soon forget) and a gorilla with attitude gave Tim “the finger” when they embarked on a stare down. It was a crazy day and so much fun! Believe me, if it works for you try to plan to arrive early (our zoo opens at 9:00 a.m.) and pick a day that is overcast or lightly raining. Morning is often feeding time as well and that too can cause the animals to be more active. You won’t be sorry! Just for fun, I’ve included a few pics from our trip to the Columbus Zoo. Seriously, we had such an awesome view of every animal….the overcast and rain make for more active animals. Can’t you just see the attitude this gorilla had? Let’s just say we had lots of questions to answer. I’d love to hear from you. 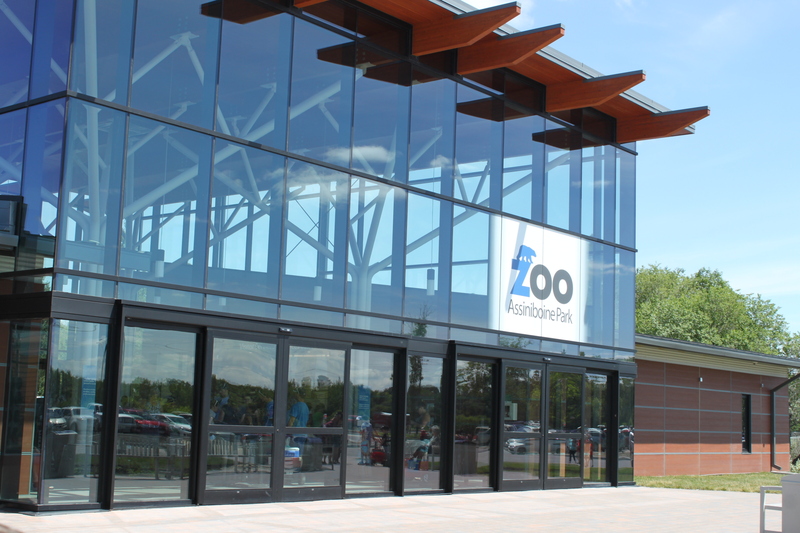 Let me know what you think of our new exhibit and zoo upgrades or your favourite zoos to visit.